One of the big questions that most investors have once they decide to open an RESP account is how and where to do it. The best option if you want to do the investments yourself is to open up an account with TD and invest in their e-Series index funds. These index funds have the lowest MERs (costs) of any funds in Canada so they are a pretty good deal. This account has no annual fees either. The idea with these funds is to do a basic couch potato portfolio. Please note that the TD e-Series accounts do not support the additional CESG grants or CLB for lower income families. To get those extra grants, a regular TD mutual fund account can be utilized. This post describes the exact procedure to get this set up. Basically you open up a TD mutual funds resp account and then apply to convert it to a TD e-Series account and then makes your purchases. Here is another post on getting started and please check out my asset allocation post on this subject. This post contains a sample RESP portfolio using the e-Series funds and includes the exact fund names as well. Thanks to the Canadian Capitalist for doing all the leg work on the TD accounts. Another option for DIYers is to open up a discount brokerage account. You can see a comparison table of the various Canadian discount brokerages. One advantage of these accounts is that you can buy Exchange Traded Funds which are even cheaper than the TD index funds, however you will only be able to purchase them infrequently, otherwise the transaction costs will make them too expensive. If you don’t feel comfortable setting up an account and investing on your own, and don’t mind paying more money in fees then you can usually get an RESP account setup at your bank or with a financial advisor. Try to watch the fees since most resp accounts are charged an annual administration fees. Pooled or group plans are run by resp providers and should be avoided. They have very high fees and a strict contribution schedule with onerous penalties if you don’t keep to the schedule or the child doesn’t go to school. If you are already enrolled in one of these plans then you should continue with the plan, it’s not worth the penalties to switch out. These plans are not that bad but there are much better choices available. 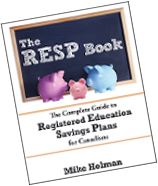 Check out the RESP rules page for a list of more detailed RESP articles on this site. Mike: Thanks for the links. You may want to point out that one drawback of TD RESP accounts is that according to some readers, they don’t have a way of getting the CLB and the extra CESG grants for low-income families. That’s something to check first before signing up with them. Good point CC. I’ll make the change. Mike, I’m looking to open an RESP for my nephew. Long story short we plan to contribute once a year in order to maximize the grant (i.e. $2500 at the moment). Above you mention that buying ETFs frequently is not advisable due to the brokerage accounts. In a once annual contribution situation would you go with the TD e-series or EFTs? Do you know if the EFTs have the same problem with the CESG that the TD account does? Any info you have would be greatly appreciated. Thanks so much! Julie – for RESPs I would definitely tend towards the TD e-funds. RESPs balances will never get that high so the lower management fees on ETFs might not make up for the transaction costs of ETFs. That said if you are only making a couple of transactions per year and you use a low cost brokerage (like Questrade) you might save a bit using ETFs. I would expect that all brokerages would be able to handle the extra CESG and CLB but you would have to verify with the brokerage before setting up an account. Keep in mind that there are extra forms for the CLB and extra CESG which need to be filled out. Also, you will need the primary caregiver to fill out part of those forms as well in order to get the extra grants. I think I read in one of your posts about how the TD e-series funds could not accomodate the CESG, and that that money had to be invested in a TD mutual fund. Do I have that wrong? If not, I’m wondering if that’s another advantage of ETFs if indeed they can accomodate the contributions and the grant. Thanks for the tips re: the paperwork. I really appreciate your help! (P.s. yep, I’m subscribed to the comments now). Hi Julie – that’s good to hear! You are an awesome aunt! I think you might have one misconception – TD efunds CAN handle the basic cesg grant of 20%. It’s the extra CESG grant ( for families with less than $71k in earnings) and Canada Learning Bond (for really poor families) that TD efunds can’t handle. If your bro’s family makes more than $71k then they will only be eligible for the regular cesg and the TD efunds will be perfect. Of course the ETFs will be fine too. Aha… I did misread things. Thanks Mike. I do expect they might qualify for the extra CESG grant. Do you happen to know whether the difficulty in handling the extra CESG is unique to the TD efunds? Sorry to be a pain. I’m really grateful for your help! Hi Julie – no trouble at all. I suspect that most resp providers can handle the extra cesg grant – I think TD efund accounts don’t have this capability because they are very low cost (ie low budget) and it is not worthwhile for TD to build the extra functionality since most people who qualify for the extra grants don’t have resps. Another option for low cost index funds is Altimera – last time I checked they had a Precision series which had mers of less than 1% – You will pay a bit more in mer but I’m positive they can handle the extra grants. Your idea of using a discount broker is also a good one – just check about the extra grants first. I’d be surprised if any of them don’t handle them (but let me know what you find out!). Thank you again for your help last year! That’s great to hear Julie. I’ve since learned that a lot of self-directed resps don’t offer the extra grants so they are more rare than I thought. Hi Mary – I refer to “pooled plans” in the article – I’m not a fan of them. The scholarship resp companies are pooled plans. Pooled plans: we reviewed the USC prospectus and did a bit of online research. We can’t see any reason why an informed person would choose them. An example: signing up to contribute 2500$/yr means enrollment fees of 4600$ which you get back at maturity 18 yrs later. What that means is you’re giving USC an interest free loan for 18yrs. At even 4% compounded over 18 years, that 4600$ would be over 9,000$. That means a fee of over 4000$ before you even get to the other admin fees they charge. Compare that to 50$/yr to get an RESP set up at a credit union. Plus the plan is less flexible than a do it yourself. E.g., more fees to transfer your kid to another fund if they want to go to school part time. A note about our salesperson: unprofessional and pushy, but conveniently showed up at our house when our son was 3 months old and it was difficult to manage an appt at the bank. I don’t think she had a clue how disadvantageous the plan she works for is. And the way they keep the money safe is by investing in safe assets like GICs and government bonds – I think Warren Buffett might be able to train an intelligent dog to manage that kind of portfolio. His time doing that might justify the thousands of dollars of fees to manage such low risk obvious stuff. The only reason I can see for a pooled fun is that you’re sleep deprived with a new baby and are too bleary eyed to read a contract if you let a rep come over to sell you. 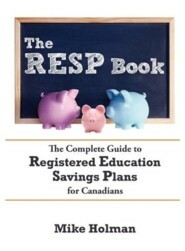 So my advice: do your RESP with a credit union where you can get set up for 50$/yr. Thanks for the great comment Barb. The “non-profit” sales pitch is 100% bull. All mutual funds are technically non-profit because they are “owned” by the unit holders. The company that controls the board which looks after the fund (ie the resp company) is for profit and charges accordingly for things like fund management and record keeping. Nothing wrong with profit but they should be more honest about it. Mary, I don’t know anything about who you are talking to or what they are selling. The best advice I can give you is to take your time and do some research. There is no rush to set up an resp. Feel free to send me an email if you have specific questions. I have a question about group plans…I was suckered 4 years ago and sign my two sons up with Heritage Education Fund. Recently I have been talking with a financial adviser and he suggested that if I go with Dynamic Power Canadian Growth Class that it might be worth while to switch. Anyone have any advice as to what the smartest thing for me to do in this situation is? Any advice is appreciated!!! Chris, that ‘advisor’ is just telling you want you want to hear in order to get your money. Don’t listen to him. As for whether you should try to get out of the Heritage deal….you haven’t provided any information at all to do any kind of analysis. I signed up Nov, 2005. I have two plans and I contribute $75/month for each kid. Total $150/month. Fees for both plans are $1500 each. In the Prospectus it states that if you terminate the plans all these fees are not returned to you. There is little flexibility for payments if for example you loose your job and can not pay. I guess my question is do you or anyone on here think that if I pull out now loose the $3000.00 in fees sign up with something else if I could possible come out of this thing okay? On the most recent Heritage statement it says that my oldest son will have $40,000. 00 for option one (Must enroll in a 4 yr program) and $31,776.00 for a self directed option 2. For my youngest son they say he’ll end up with $43,391 (Option 1) and $34,276.00 (Self directed option 2). Is this the kind of info you were looking for. I feel really sad about this. I would really appreciate some sound advice. One more thing…if you do stick it out with Heritage they do return those fees in the end. I’m with TD e-Series for the kid’s RESP but lord o’ lord was it tough to setup. There’s no e-Series RESP application form – you have to setup a regular RESP account and then go online and submit a form to convert to an e-Series account. Then once the account is converted you have to convert the funds to e-Series funds. And you have to re-do the CESG contribution instructions since they can’t be invested directly into e-Series funds (I have no idea why, and neither does anyone at TD). The MER on TD’s e-Series funds is the lowest of anything out there. But the hassle around e-Accounts and the horrible customer service for e-Accounts is enough that I would not recommend that route to anyone who isn’t ready to do the work by themselves – my discount broker is more helpful than TD is! I found this wesite too late….as Barb said I was that very sleep deprived mom of a one month old and they sold me. For the past year and a half I was under the impression that I was doing my child some good only to find this info after I started to research what USC was. I am really unhappy with USC and I want out. I have over $1600 invested in them now and they are telling me If I try to switch out to another company they will give me $39. Mike any advice? @Brooke – Not much you can do. Given that you are pretty early into the program, bailing out might not be a bad idea – although it will cost you quite a bit. Should I listen to her? or stick with my idea? money total until he goes to school? I really have to convince specialist and my husband as well. I am very conservative and don’t want to take high risk. Hi Carrie. Stick with your idea. You can always invest in stocks later on if/when you become more comfortable with the idea. I can’t predict how much money you will have because I don’t know what interest rates will be in the future. Mike, you say “Please note that the TD e-Series accounts do not support the additional CESG grants or CLB for lower income families. ” My question is do the e series support the CESG grants and not the ADDITIONAL grants, …. or do they NOT support any CESG grant at all? Colin, its pretty clear: “additional grants for lower income families”. The standard grant is paid. I want to reduce the amount of money I put in each month because I don’t make enough money. I am having difficulty making ends meet. Global says I will lose money if I reduce but they are fine no problem increasing though. How can I reduce payments without penalty. I am a single mom paying $ 240 each month. Hi Colin, if you don’t mind, i will answer your question. Based on what i read from his posts, the TD e-series, supports the basic CESG (that is 20%) but it does not support the extra CESG (for family incomes less than $71k) and the CLB (for really poor families). Mike, my questions are that, i don’t understand your advice about how to get the extra CESG (income <$71K). Should i just forget about the TD e-series all together and stick with the TD mutual RESP acct? Or do i keep an e-series acct and then open a mutual RESP acct just for the extra CESG? That might by a costly option, i am not sure as i have not looked into the accts yet. For my first child (who is 4yrs old now)i signed up with CST in 2011 without any research, big mistake; I contribute $130/mth. I found out now that i can contribute more to max the CESG. So i want to open a TD e-series and top up the contribution (and also last year). I want to open an e-series acct for my second child (6 mths old), and i know that i qualify for the extra CESG for familiy income <$71k. Also in regards to that option, is the extra CESG assessed or applied for on a yearly basis? I ask because my annual income varies from year to year, as in varies above and below $71K?